Baked Beans is not Asian. I don’t think it is. But I’ve seen some of the rice shops here in Kuala Lumpur which serve baked beans cooked with other ingredients. This is just one of the many variants and it adds a bit of difference to the usual baked beans. Heat oil in wok and fry potatoes till golden brown. Remove fried potatoes and set aside. Remove oil and leave just about 1 teaspoon of oil in the wok. Fry the onions till aromatic. Add minced pork and stir fry till cooked. Add baked beans and return the fried potatoes into the wok. Stir well. Add water and seasoning and bring to boil prior to serving. Love your writings.. anyway just wanted to say that if you add a bit of tamarind juice to your bake beans dish.. it’ll bring out the flavours for this dish.. keep up the brilliant posts! DT : Thanks for your encouragement DT! And thanks for your tips 😉 Just wondering whether it will make the dish a tad too sour? tigerfish : Hmmm….. *drooling over pasta bake*….. shall I have a Delicious Whatever Food blog then? LOL! 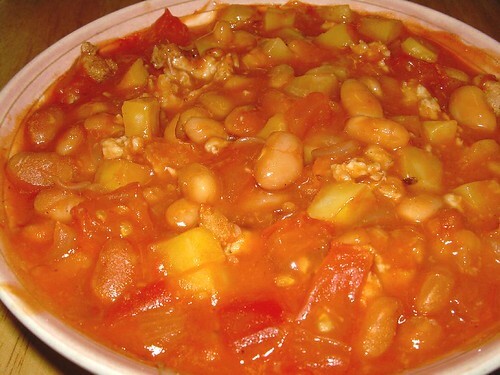 I love baked beans, sometimes I add bacon or sausage to it. Some “png chai” food stalls in Singapore have baked beans with luncheon meat as a dish. simcooks : Yes, baked beans is only the basic. The rests are add-ons. 🙂 The Brits love them! DT : I might try it one day 🙂 Thanks for sharing! I really love this recipe…. I added tomato to it!!!!!!!!!!!! My other half loves it too!! sillylupie : Wow! That’s a really tomatoful meal! I tried the recipe today. Wow, it great. I always cook the potatoes together and didnt add in tomato sauce. So this time, I follow your recipe, yummy. Simple, cheap and nice. Be following other of your recipe. Thanks yeah. Thanks for the recipe. My wife is pregnant and very sensitive to food that’s too overwhelming. She loved this simple dish as it was simple to eat. I made some stir fry cabbage on the side.